And, look out, the worst time to go on a short break, too!! Except, well, my birthday’s in three days (gonna be 30, that’s important!) and I need a couple days off for that and also to play catch up to get back on my regular schedule. So, see you sometime around the 19th. Have fun guessing who’s behind the curtain. It’s probably pretty easy to guess. I love the first panel so much…the characters just move so nicely! You can easily see how they’re shifting their weight and…I dunno, I love it! Hey, happy birthday, man! Good wishes to ya! And OH GOD, I’m just gonna be tearing away at myself until the next update (the suspense is killing me as I type this). I have to say, though, that that last panel is fabulous. The perspective, the detail, the colouring and shading, and the eerie glow. It’s just perfect! It’s not gonna be Schtein. I agree. As Schtein is considered officially dead and is now in the clutches of Teleportin’ Kevin and the Conspiracy, why would those pulling the strings decide to let Eric and Delia in on the secret? Admittedly, Delia is now working for, or with, James Cain, and he did tell her some things about Herville Schtein and Schtein’s father that are not common knowledge (more like nasty rumours). But if he wanted her to know that Schtein is still alive, he could simply have told her in the office. No, my money is on Langstrom. Or whoever those body parts belonged to that we saw materialize in a cloud of debris above that beach somewhere. Medical research? Last panel looks like mad science cloning tanks or bakta tanks. I wager, even if Langstrom wasn’t horribly burned in the explosion, he might be in need of having some limbs or organs regrown. The unstable exotic matter energy field of Schteins space-folding teleporter tended to turn the test animals’ bodies inside out… if they didn’t implode, or burst into flames (Chapter 1, pages 21 and 35). 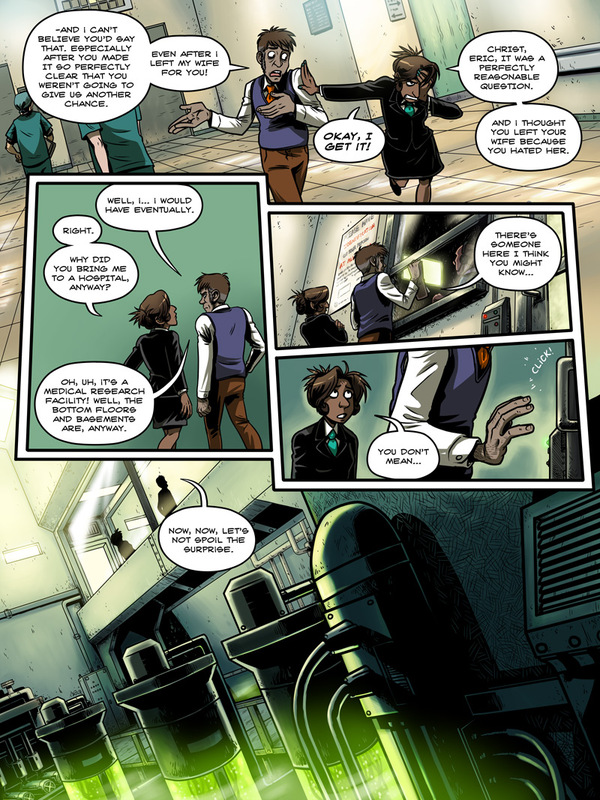 Given that Langstrom stole Herv’s research notes to built his own teleporter but didn’t know about the working improvements Delia had made… plus Schtein’s sabotage… the results may have been messy. I doubt it’s Director Edelmeyer or someone else who blew up with the lab, because that guy wasn’t important for the plot. Those are probably cloning vats with mini-Schteins (or the people who died in the explosion he caused). Well, Happy Early Birthday to you. Mine’s on the 12th, so I’m looking forward to that. But now to add on the list is this wonderful cliffhanger. When Eric is typing in the code, his hands look just a little bit big, no, chubby would be it. I like Delia’s walk in the first panel is great, combined with the expression it makes her look like she’s pressing forward towards her destination but with the momentary urgent trust that almost makes her stumble in an effort to separate herself from Eric. I reeeeally want it to be Schtein, but I know that’s probably not the case. Also, that first panel is awesome, you really captured the movement and “feel” nicely in it; I just love how you drew Delia. And, even if it’s in advance, happy birthday! I hope you have a great time! I bet it is a jackal. It’s always a jackal. I bet the ‘someone you might know’ is not Schtein, but one of the scientists who somehow survived the teleportation experiment. After all, we saw it was successful! I just hope he’s not Langstrom. Last panel is beautiful, anyway. I like perspective and green glowing fluids. It’s going to be one of the long-forgotten mutated hamsters, sitting at a desk with a cigar in its mouth. I’m positive. Dude, thanks for making the bonus birthday comics! Young Schtein with glasses, I’m in love. I’m a few years behind, but I’ll be celebrating my birthday right there with you on the 13th! Happy Birthday to us! Not looking forward to next year’s birthday though. Friday the 13th, 2013. Friday the thirteenth squared. since you’re my birthday twin I’ll let you in on a math secret: our birthdays are always on friday the thirteenth every year AFTER leap year. It’s true! Woo thirty! It’s all downhill from here.